So the other day when I wrote about finding hot peppers at the farmer’s market, I mentioned I would write about how to cook with them safely. The truth is there are a few simple steps you can use to get a lot of the heat out of these peppers without setting your mouth on fire. 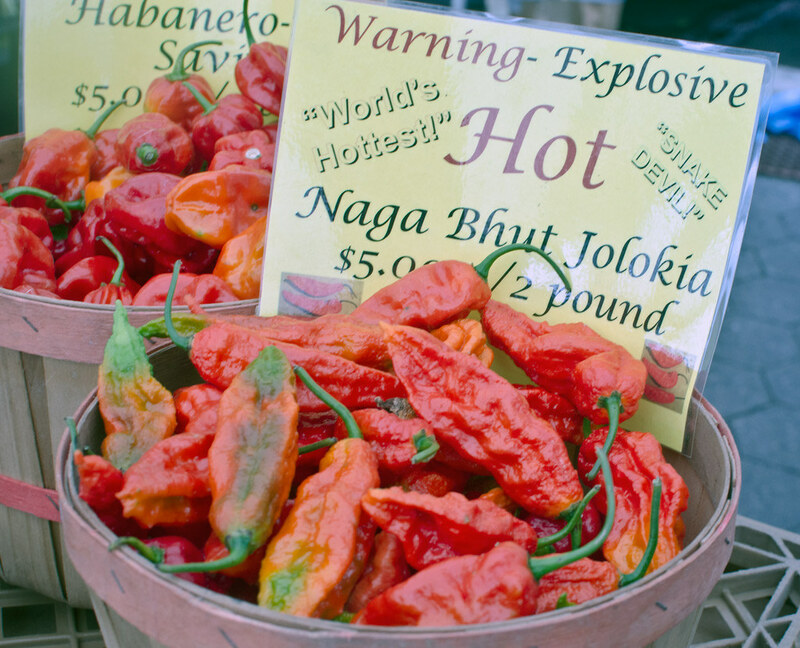 I picked up a single naga bhut jolokia at the Union Square Greenmarket — one of the hottest peppers in the world, according to the Scoville scale. The Scoville scale is a measure of how many parts of water you have to add to the chili to dilute it enough not be spicy. For reference: a bell pepper is at zero, jalapeno is around five thousand, habaneros are around two hundred thousand. The naga is rated at around one million. I love spicy food, but that’s just ridiculous. So how can you cook with something so hot, safely? I was really craving for anything salt and pepper. Salt and pepper squid, salt and pepper pork chop and salt and pepper shrimp. 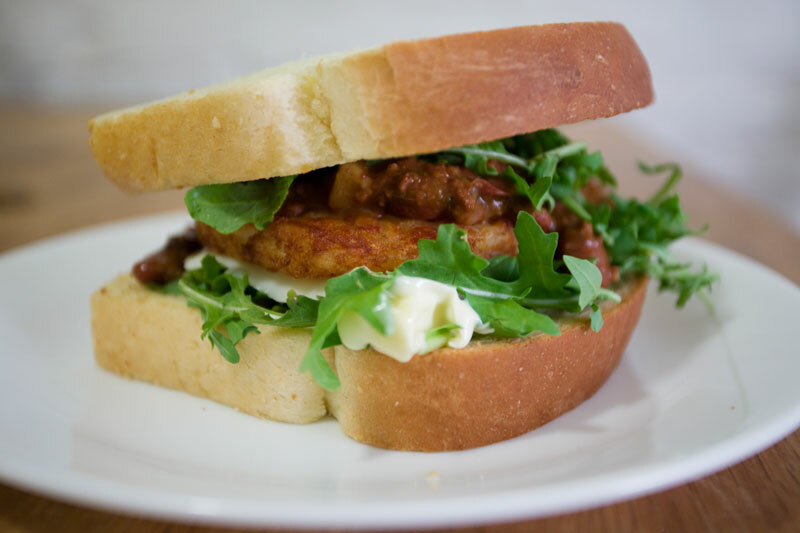 I wanted to try and make it but wasn’t tooooo sure the exact recipe. But I think all you need to do is first deep fried the squid or pork chops or shrimps then in a hot wok cook garlic and peppers and then add in the squid or pork chops or shrimps. Right? Well I guess eventually what I made was different yet similar. I got a pound of ground pork, garlic, ginger, scallions, onion, bull’s horn chili, and Thai basil. This will cook fast so get all the prep work done before you start cooking. Diced up 1 whole medium sized onion, grated a piece of ginger which yield about 1.5 tablespoons, diced a WHOLE bulb of garlic, sliced couple scallions, get a about cup worth of the basil and sliced up the chili without the seeds. I realized after eating this the bull’s horn chili isn’t spicy at all, I think next time I’ll chop up some jalapenos. So to make this dish, heat up a wok. Get it really hot then add about a tablespoon or 2 of oil. 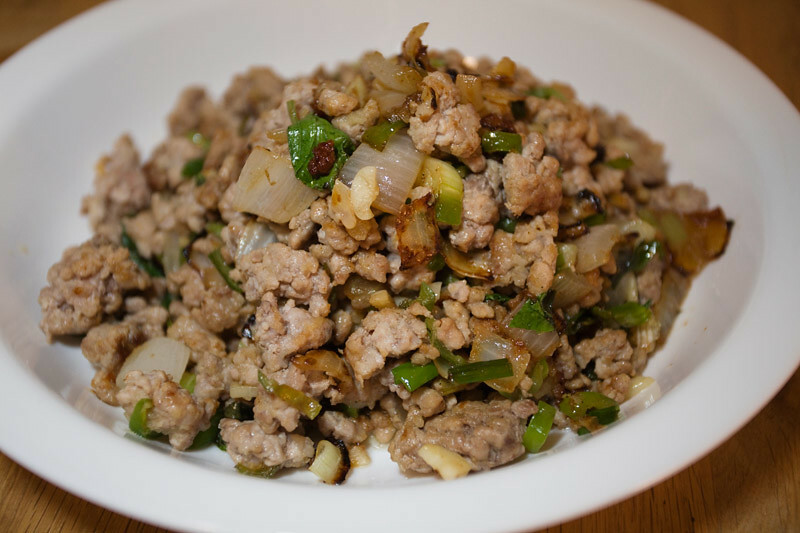 Throw in the ground pork and cook it till they’re just about done, then put the pork into a bowl. Put the diced up onions and cook it till they’re translucent then throw in the rest of the ingredients. Stir stir stir! When everything’s about done, add the pork back in and stir stir stir, mix mix mix. Season it with salt and pepper to your liking. Annnnnndd done. This goes AWESOME with plain rice. What the hell is mush you ask? Believe my friend Phaedra came up with it and gave it its name. Few years ago I had my first mush and it was DELICIOUS! It’s quite simple actually combine chili with mac n’cheese and you get mush! Recently I found myself at Trader Joe’s again, trying to make something quick, simple and cheap, I used a recipe from my sister, Connie, for a cheap quick Trader Joe’s chili. 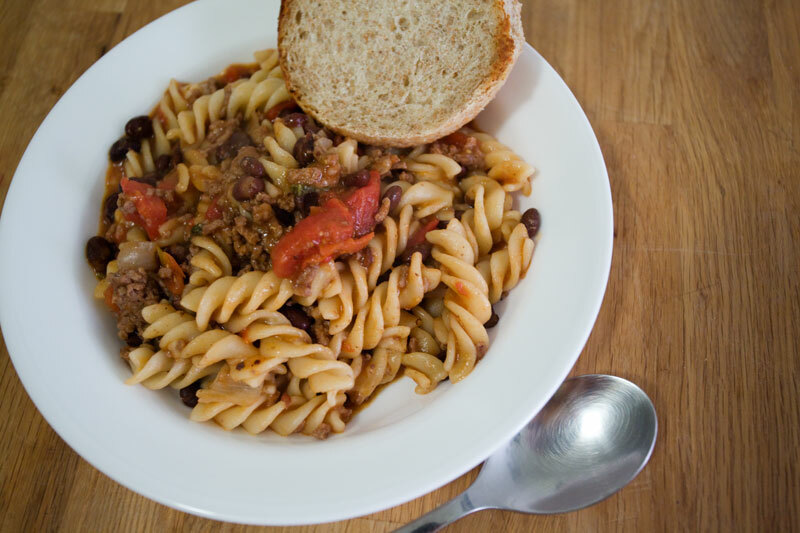 Get a pack of ground beef around $2.25, a can of black beans and a can of tomato soup. Well I left the list of ingredients at work so I had to go with my memory. I thought she told me a can of diced tomato SO I got a can of diced tomato instead of a can of soup. Anyways, I also grabbed a bag of pasta. I went home and cooked the pasta just couple minutes short of al dente time, dumped the cans of black beans and diced tomatoes and mixed. In another pan while the pasta was cooking I cooked the ground meat. When the pasta mixture is nearly done I added the meat and a whole lotta parmesan cheese. Served it with bread! I have seen photos of how the citizens of Cincinnati eat their chili. I have seen it on the Anthony Bourdain show and I have had friends described it to me when they went to Cincinnati for a long weekend but it wasn’t until last Monday that I finally came face-to-face with it. Every last Monday of each month, Edward’s in Tribeca does a Cincinnati Night where you’ll get to eat some of the popular Cincinnati food items. Of course the one thing everybody goes for is chili from Skyline Chili. Chili from Cincinnati isn’t as thick as regular chili and they add cocoa powder into it to give it a bit of sweetness. 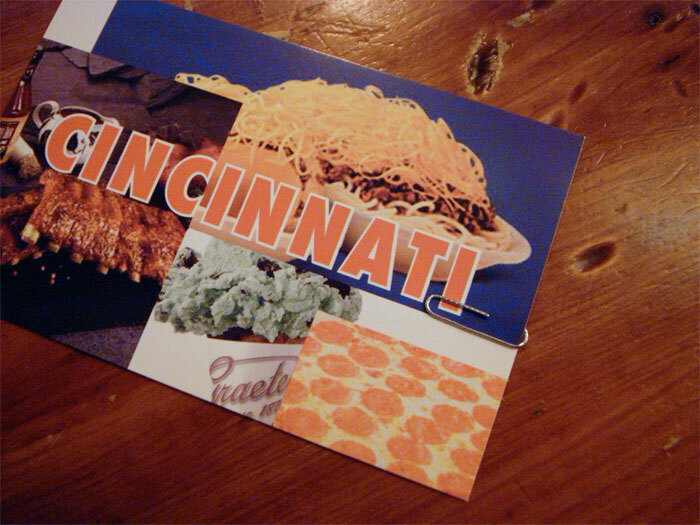 Besides Skyline you can also get ribs from Montgomery Inn, pizza from Larosa and ice cream from Graeter’s. Few weekends ago, I followed my friends, M & P, down to Virginia to visit their parents. It’s always nice to get out of the city, too bad I don’t do it enough. M’s mom was super nice enough to make an apple pie just for us! On Saturday night M’s parents took us to Hard Times Cafe for dinner. They specialize in chili, a Texas chili, a Cincinnati chili, a Terlingua Red chili and a vegetarian chili. What’s great about Hard Times Cafe, besides the name, is that for newcomers they offer a little tasting of each chili. My favorite was the Cincinnati chili because it was slightly sweet. 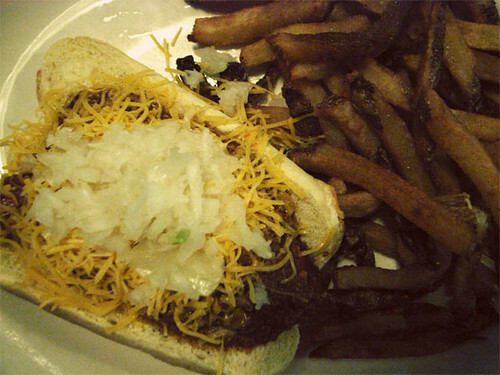 I got the Hard Times chili dog with the Cincinnati chili. It was really good and messy to eat. Fork and knife were used. Yum. – Hard Times Cafe, 4069 Chain Bridge Rd Fairfax VA 22030. They have other locations.